While I am not normally a fan of vampire and undead stories, I am a fan of Thorn and Lily. Thorn is a fierce young boy whose a slave as the story opens. Thorn has a gift for getting himself in trouble, which he does right off the bat when he infuriates his current owner. Luckily or maybe not to luckily, this brings him to the notice of Tyburn, the executioner for the country of Gehenna. Tyburn buys Thorn and takes him back to Gehenna where Thorn meets Lily. Lilith Shadow is the only remaining member of her family, her father, mother, and elder brother were murdered a few months back. And now Lily has been pressured into marrying Gabriel, the son of the Duke of Solar, long an enemy Gehenna. But Lily doesn't like Gabriel and she thinks its unfair that girls aren't allowed to practice magic. 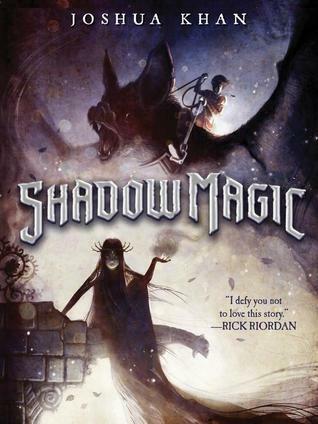 But shadow magic comes easily to Lily and she may need it to save her home. Before long Thorn and Lily, and a Solar prisoner named Kleef find themselves neck deep in trouble. Between accusations of treason, unauthorized magic, and a scarred man who seems to be necromancer, Thorn and Lily end up needing all the help they can get. Khan has written a book full of great characters, witty/sarcastic dialogue, and plot twists galore. I especially liked Hades, the giant bat that Thorn befriends. And Lily, fiesty girl, who is determined to fight for her home despite the efforts of almost everyone else to keep her in her place. While the book is quite dark, the characters keep the story from being overwhelmingly so. The story moves along briskly making the book hard to put down. I'm anxious to get my hands on the second book so I can find out what happens to Thorn and Lily next. CYBILS WINNERS--to check out the other great CYBILS 2016 winners see here.